Not everybody is happy in the countries where the tidal-wave of immigration and border-jumping is occurring. Plus it’s Winter almost and those from hot-lands physically (and culturally) are unprepared for their assimilation – indeed they resist assimilation, so why move? Because progressives have decided that assimilation is “unfair”? Maybe it’s time to re-open Ellis Island, so the proposed 160,000 Immigrants can begin assimilation with a common base of experience and proper orientation and expectations can be addressed: like learning English – and you can only have one wife. All things Progressives hate. And Old-What’s-His-Name (Ken Burns) can do a fine PBS documentary about it, set to violins tugging at heartstrings. 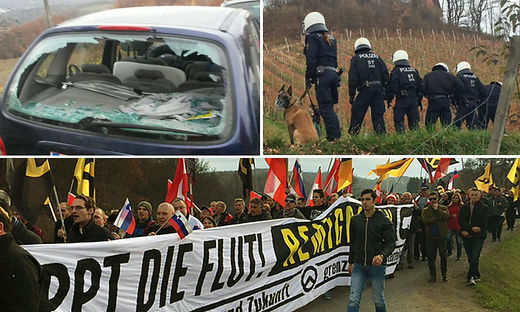 Meanwhile riots and marches against the huge influx are occurring in southern Austria. UPDATES – some format edits for clarity, plus: With the vacancy, incapacity, and inaction of Obama and NATO, we see an emergent alliance of four Central European states – the Visegrád Group: the Czech Republic, Hungary, Poland and Slovakia. All have grouped forces together recently to counter the human-wave onslaught and protect each others’ borders. Meanwhile The The French interior minister says he’s going to start the “dissolution of mosques where hate is preached.” The French don’t have a 1st Amendment (or a 2nd Amendment for that matter), so they can do that – and they have already banned headscarves too. The “Refugee Crisis” is not just a Trojan Horse onslaught, it’s structural. They are building cultural INFRASTRUCTURE person-by-person, using Human Capital as a weapon, and every visible Hijab & Burka signals to Terrorist that he’s in a relatively Safe-Place where his ideals resonate and are not condemned. Hope there’s more like that coming. States who don’t have any way of reviewing or determining the process are helpless to the invasion. And more, now it’s Winter in Sweden…Sweden will impose temporary border controls starting Thursday in response to an influx of refugees, a turnaround for a country known for its open-door policies that also threw down the gauntlet to other EU nations hit by a migration crisis.Sweden’s prime minister is defending his decision to reintroduce border controls, saying it is no longer possible to properly control the country’s borders. After the recent events overseas and amid gloomy weather Mrs. Crashr’s excellent and very thorough impulse to organize has flared-up, and so we’re assembling the necessaries. It’s already all here for the most part, but not in a kit-form for the trunk of the car or back of the truck. In the last issue of GUNS magazine too, in Odd Angry Shot, the issue of preparedness arose and Teh Kit – and among the things listed was a slight attention-getter, one element of the med-kit that is often lacking but is dear to both our hearts – an emergency dental kit. We’ll have to see what CVS has to offer with out %20 coupon this weekend. Besides, I always wanted needed a crowbar anyhow.